There was a time when “value laptop” meant an underpowered Black Friday special at Walmart built from cheap plastic, with a barely-visible display. Those days are over. Today, “value laptop” means a machine with a solid chassis and decent components for a much more affordable price. In our Acer Swift 3 versus Asus ZenBook UX330UA showdown, we pit two recent value machines against each other to see which is the affordable champion. 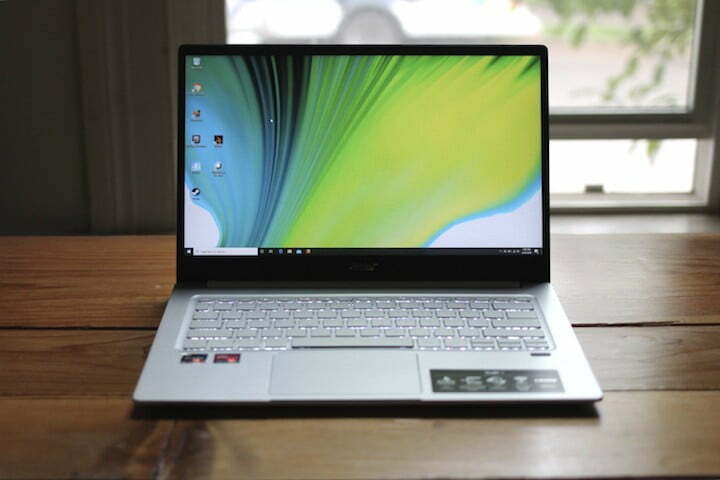 We reviewed the 13.3-inch ZenBook UX330UA in a configuration that includes a seventh-generation Intel Core i5-7200U CPU, 8GB of RAM, and 256GB SSD, for $730. Our review Acer Swift 3 was identically equipped for $650. We found them both to offer solid value for the money, with a bunch of great qualities that make them well-suited for buyers who need a workhorse productivity machine that won’t weigh them down, nor make their wallets feel too much lighter. Yet there are enough differences between the two machines to make for a clear winner. There was a time not too long ago when buying a machine close to the $500 price point meant accepting cheap plastic and a creaky design. 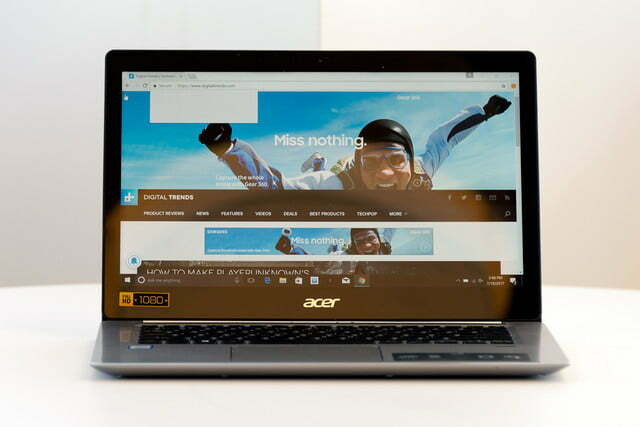 Those days are over, and we’ll begin by talking about design and build quality — both the Acer Swift 3 and the Asus ZenBook UX330UA sport a metal chassis and solid builds that belie their relatively budget prices. As a 14-inch machine, the Acer Swift 3 is naturally a bit larger than the ZenBook. It weighs in at 3.31 pounds and is a tiny bit chunky at 0.71 inches, with metal used in both the display lid and the lower half giving it a build that we described at robust and premium. We noticed some flexing in the chassis when we really pressed the issue (no pun intended) but in normal use, the Swift 3 felt plenty solid. The ZenBook UX330UA was thinner at 0.53 inches, and lighter at 2.6 pounds, given its smaller display and overall chassis size. 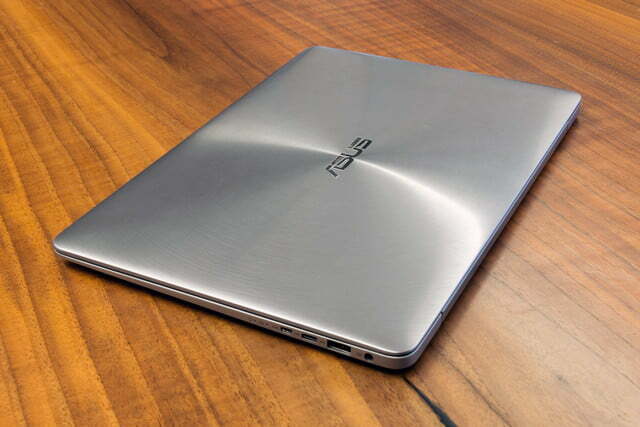 It also benefits from a generous helping of metal in its chassis, and the “spun metal concentric circle” pattern that’s common to the Asus line added a bit of design flair. 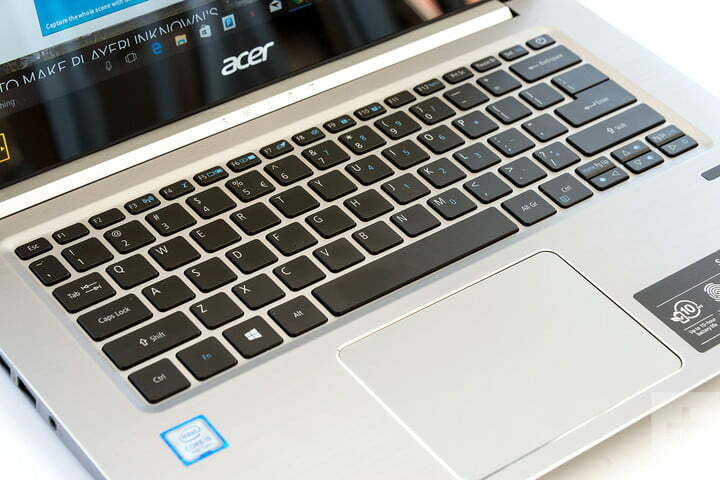 The build quality was also solid, with no more flex than Acer’s value-oriented machine. While the competition is close here, we give the nod to the ZenBook. It’s quite a bit more portable, feels a bit more luxurious, and stands out more than the Acer Swift 3 because of the concentric circle pattern etched into the lid. As noted earlier, we reviewed identically equipped machines. Both came with workhorse Intel Core i5-7200U processors and 8GB of RAM. The main difference in terms of performance was the choice of solid-state drive (SSD) technology. Acer went with the faster and more modern PCIe version, while Asus saved some money by going with the older — and slower — SATA version. Unsurprisingly, performance in the Geekbench benchmark was nearly identical, with the Acer Swift 3 scoring 3,809 in the single-core test and 7,515 in the multi-core test, and the ZenBook UX 330UA scoring 3,711 and 7,075. Those are close enough to be a wash.
On the other hand, in our more intensive Handbrake test that encodes a 420GB video to H.265 format, the Acer Swift 3 took 1,084 seconds and the Asus ZenBook UX 330UA took a significantly longer 1,445 seconds — that is significant. It’s possible that the ZenBook’s thinner chassis wasn’t as good at dissipating heat, and so the CPU was throttled. Next, the Acer Swift 3’s PCIe SSD scored 1,169 MB/s on the CrystalDiskMark read test and 512 MB/s on the write test. That compares to the Asus ZenBook UX330UA’s slower SATA SSD, that could garner only 489 MB/s in the read test and 422 MB/s in the write test. While both machines were plenty fast in terms of booting, opening apps, and accessing and saving data, the Swift 3 promises to avoid slowdowns when working with lots of stored data compared to the ZenBook UX330UA. In the end, both machines are solid performers, particularly for the price. But when it comes to heavier workloads, the Acer Swift 3’s thicker chassis helps it maintain higher speeds and its faster SSD gets a performance assist as well. 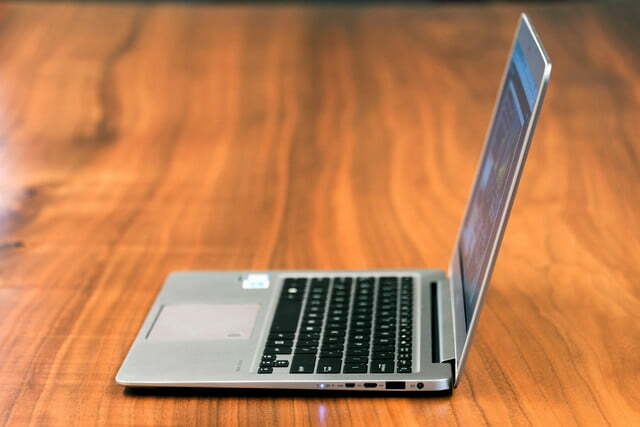 One area where manufacturers sometimes cut down on costs in value laptops is the keyboard and touchpad. It’s not uncommon to receive a mushy keyboard and unresponsive touchpad if you’re not willing to pay considerably more money. We’re happy to report that both Asus and Acer spent some time getting their respective input mechanism in order. The keyboard on the Acer Swift 3 offers a solid typing experience, and the keys are backlit with two brightness levels and, unfortunately, some uneven lighting. 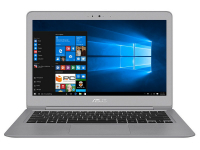 The expansive touchpad supports Microsoft’s Precision Touchpad protocol and so worked without issue across the full complement of Windows 10 gestures. Windows Hello support is provided by a fingerprint reader to the right of the touchpad. The Asus ZenBook UX330UA’s keyboard is similarly comfortable, with good spacing, a generous palm rest, and a respectable 1.5mm of key travel. The ZenBook’s backlighting offers three brightness levels, but we found all of them to be too dim, and lighting was also uneven. The touchpad also provides Microsoft Precision Touchpad gesture support, and was adequately sized, but we found the surface to be too slick for comfort. Finally, the Windows Hello fingerprint scanner was a welcome addition, but we found its placement in the upper-right corner of the touchpad to be distracting — it doesn’t support touch, so it takes away from the overall swiping area. It’s a close call here, but the Acer Swift 3 seemed just that tiniest bit more pleasant for typing and gesturing, and we preferred the location of its fingerprint scanner. Therefore, it earned the win by the narrowest of margins. 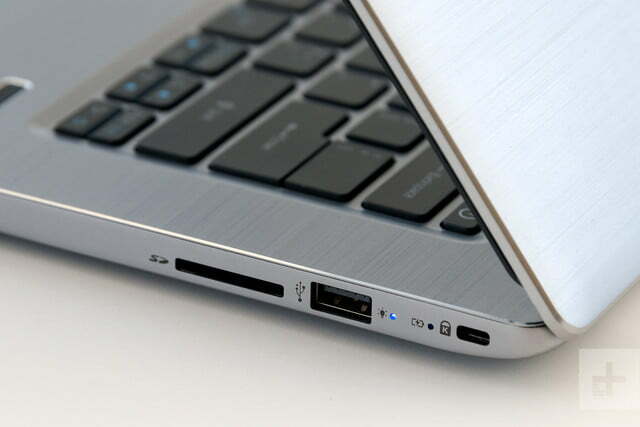 More expensive newer systems (outside of Microsoft’s Surface line) are likely to include the newest USB Type-C port. Value laptops haven’t all caught on to the new standard yet, but don’t tell that to Acer and Asus. Both of the machines include USB Type-C connections and so are relatively future-proof when it comes to connecting to newer accessories. Neither machine added in Thunderbolt 3 support, which is a bummer, but not surprising at this price point. Also, both machines disallow charging via USB Type-C, and so require proprietary power adapters. The Acer Swift 3 is the thicker machine, as we’ve noted, and another area where some extra girth can come in handy is in connectivity. Acer took full advantage of that fact, packing in two USB 3.0 Type-A ports, a USB 2.0 Type-A port, and the USB Type-C port, to go with a full-size HDMI connection, an SD card reader, and a combo audio jack. 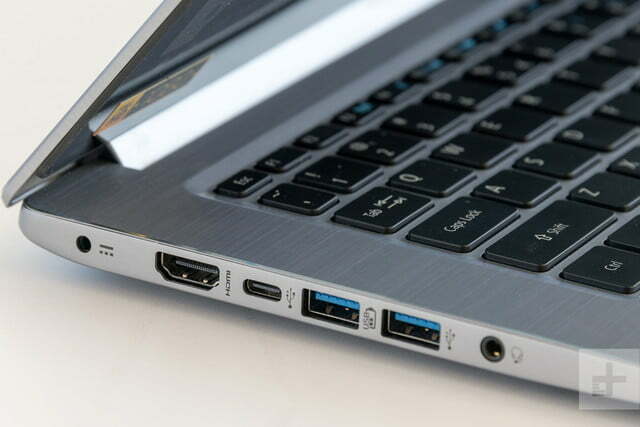 That’s a solid selection of ports that ensure you can plug in a full complement of peripherals. 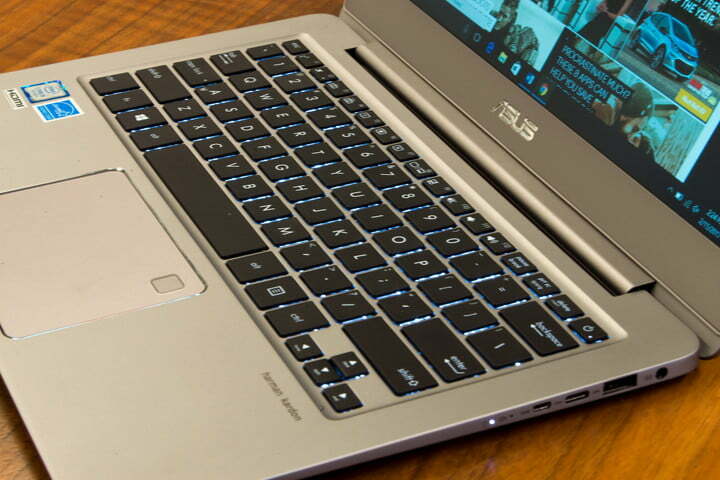 The Asus ZenBook UX330A also offers two USB 3.0 Type-A ports to go with the USB Type-C port, but it eschews USB. 2.0. It slips in a micro-HDMI port a, a microSDXC card reader, and a combo audio port. That’s a fair complement of ports for a thin-and-light machine. Both machines offer good connectivity and are future-proof given the support for USB Type-C. 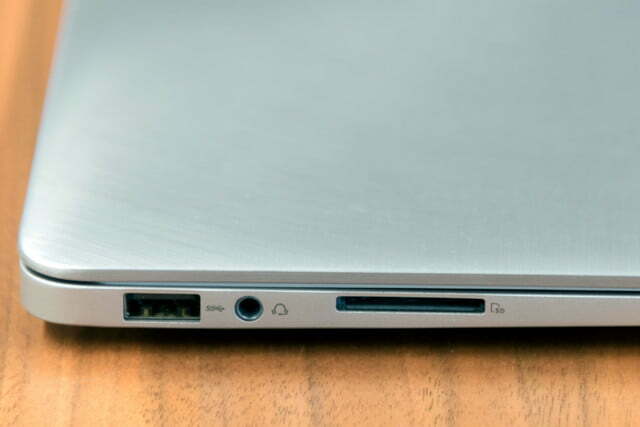 The ZenBook UX330UA has one fewer port, it requires an adapter to connect to full-size HDMI, and it doesn’t support full-size SD cards. Overall, this category has a clear winner. Both of our the Acer Swift 3 and ZenBook UX330UA review units came equipped with Full HD (1,920 x 1,080) displays. That’s more common for value laptops, but not yet ubiquitous. Yet it doesn’t mean that we found the displays to be identical. 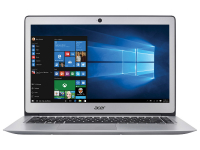 To begin with, the Acer Swift 3 is a 14-inch machine, and so a Full HD display is a bit less sharp at 157 PPI compared to the 13.3-inch ZenBook’s 165 PPI. That’s not enough to tell a huge difference, but pixel peepers might discern a few more pixels on the Swift 3. Beyond that, Acer chose a decent but not great display that offered only average contrast at 540:1, below-average color gamut at 67 percent of sRGB and 50 percent of AdobeRGB, and low brightness at only 242 nits. Color accuracy was average at 2.34 (1.o or less is considered excellent). The Asus ZenBook UX330UA, on the other hand, didn’t only rely on its slightly sharper display to be superior here. It also enjoyed almost twice the contrast at 940:1, covered a much more dynamic 98 percent of sRGB and 74 percent of AdobeRGB, and was much brighter at 315 nits. Color accuracy was also average at 2.56. The display was anti-glare, and so performed better in bright lighting than the Swift 3’s glossy display. 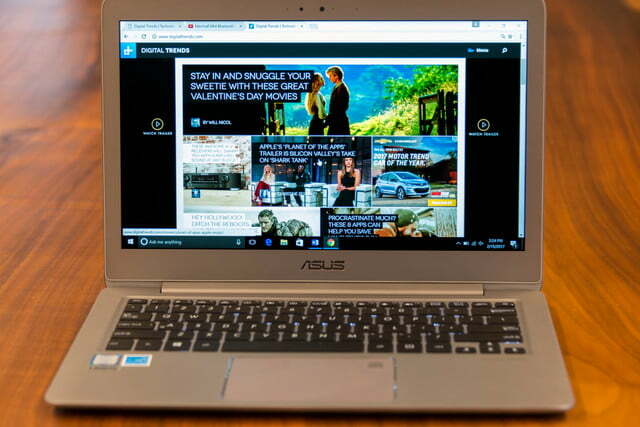 Simply put, the Asus ZenBook UX330U scores big here. Its display is sharper, brighter, enjoys better color, and has significantly better contrast. It’s also more comfortable to use in bright environments. For its first win, the ZenBook’s much superior display is significant. As mentioned earlier, the ZenBook UX330UA is a bit lighter and a bit thinner than the Acer Swift 3, due in part to its smaller display. That makes the ZenBook easier to slip into a backpack and head out for work. When it comes to how long each machine will last away from a plug, the dichotomy is a little more clear cut. Whereas Acer made use of the Swift 3’s thicker chassis to squeeze in better connectivity, it left some space unused when it came to packing in the battery. The Swift 3 had to make due with a 49 watt-hour battery, which resulted in respectable but not outstanding battery life. In our video loop test that replays an Avengers trailer from local storage until the battery gives out, the Swift 3 lasted for 10 hours and 22 minutes. In our web browsing loop test, it lasted for six hours and 14 minutes. Asus was a little more aggressive in making room for a battery with the ZenBook UX330UA, managing to cram in 57 watt-hours of battery capacity. That resulted in a machine that lasted considerably longer in our battery tests. The ZenBook UX330UA lasted almost three hours long when looping our test video, at 13 hours and three minutes. Our web browsing test told a similar story, with the ZenBook lasting an impressive 10 hours and 25 minutes — more than four hours longer than the Acer Swift 3. 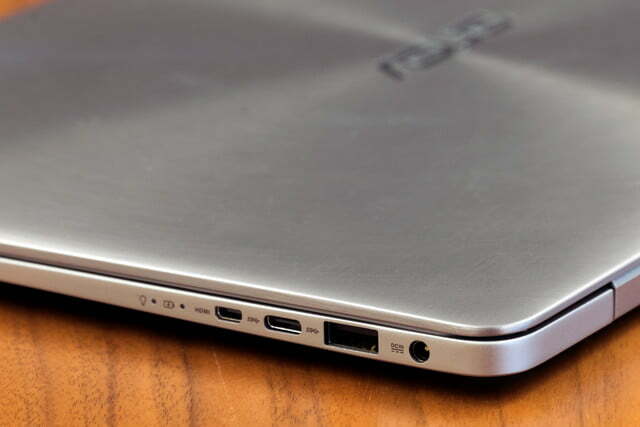 Clearly, the Asus ZenBook UX330UA is going to let you get more work done when you can’t plug in. And it’s lighter to boot. 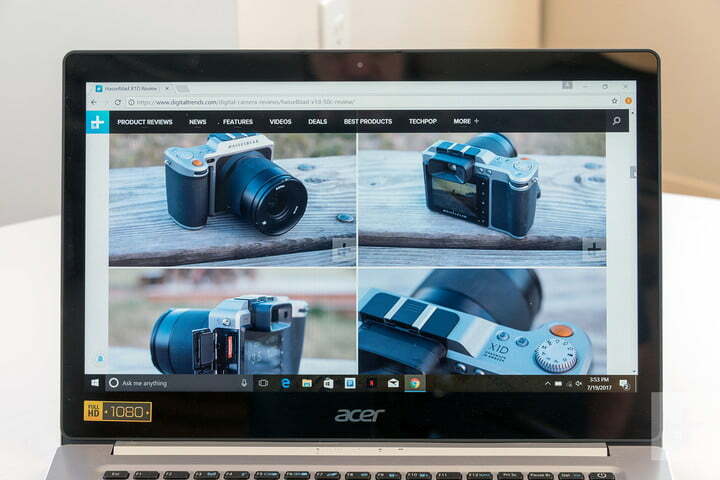 Acer has a number of configurations listed for the Swift 3, ranging from $500 for a machine with a Core i3-7100U CPU, 4GB of RAM, and 128GB SSD all the way up to $850 for a Core i7-7500U CPU, 8GB of RAM, and 5126GB SSD. 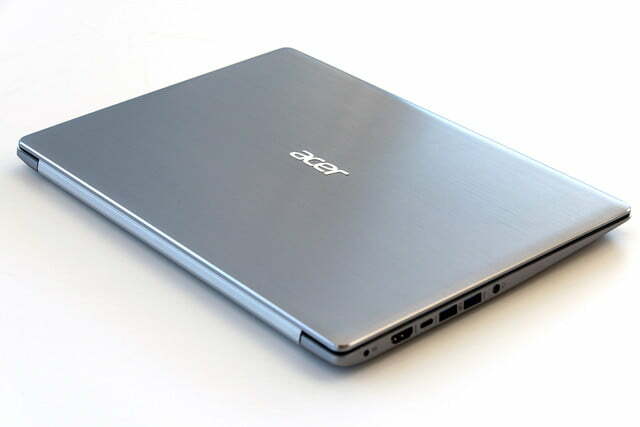 Our review unit was priced at $650 for a Core i5-7200U, 8GB of RAM, and 256GB SSD. All Swift 3 machines come with Full HD displays. Currently, although Asus plans for more configurations, the ZenBook UX330UA is basically available in two configurations. Our review unit with a Full HD display, Core i5-7200U, 8GB of RAM, and 256GB SSD cost $730, and the same configuration with QHD+ (3,200 x 1,800) resolution is available for $780. While the Acer Swift 3 is a bit less expensive and comes in more configurations (some of them quite pricey), the Asus ZenBook UX330UA wins us over for offering a higher resolution display. 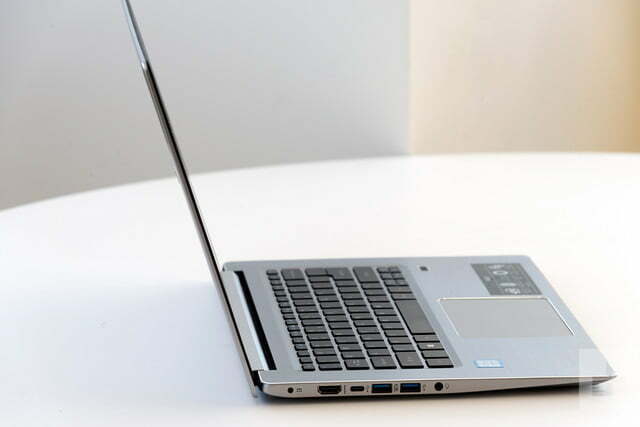 They both are well-priced value laptops, but we give a slight edge to the ZenBook. Two value laptops entered this battle, and the Acer Swift 3 took home some early wins. 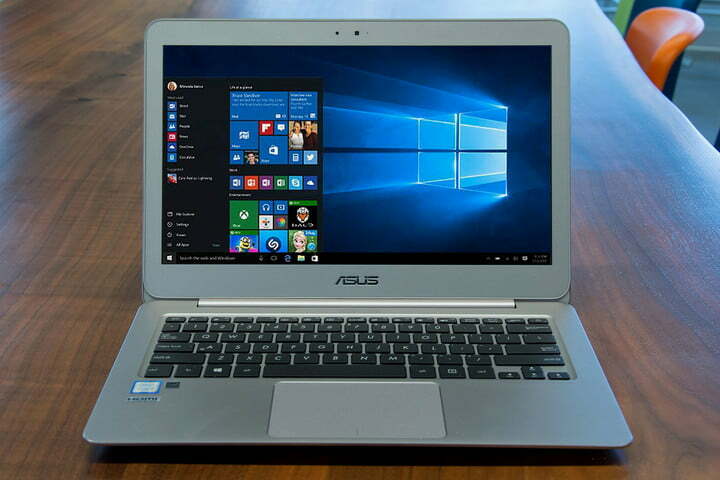 Its performance was better than the Asus ZenBook UX330UA could muster, at least in terms of storage speeds and when the CPU was being pushed to the max. It also has slightly better connectivity and input, with one additional port, full-size connections, slightly better keyboard backlighting, and superior fingerprint scanner placement. The Asus ZenBook UX330UA came on strong, however. It enjoys a superior display that’s more usable in all light conditions and just looks so much better. And, it lasts considerably longer away from a plug. Display quality and battery life are two very important laptop characteristics, and the ZenBook scored some huge wins here. Toss in the availability of a higher resolution display for not too much more, and we’re convinced that the ZenBook UX330UA is the superior value laptop.